I DON’T CARE how many times I’ve seen this water tower smiling down at me along Interstate 94 in Freeport. I still react with a smile each time I spot it. 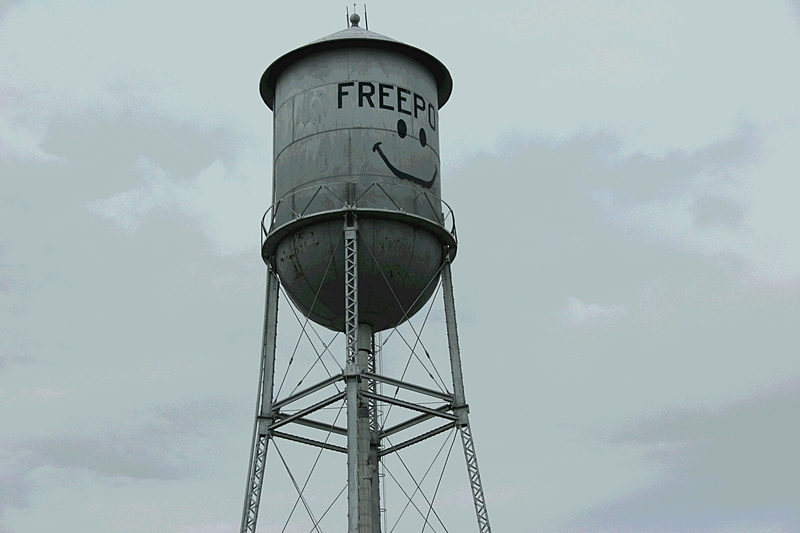 In a community which is reportedly the inspiration for Garrison Keillor’s fictional Lake Wobegon, this water tower epitomizes “Have a good day” in a singular visual. And that, my friends, makes me happy. It DOES Make You Smile:) Happy Saturday! Old style water towers like these are becoming less common, another reason I appreciate this one in Freeport. I love when you feature central MN! We enjoy eating at Charlie’s Cafe there and then visiting the Hemker Park & Zoo right outside of town. Fun destination! Have not been to Charlie’s Cafe, but am aware of its great reputation. I did not know about the zoo, though, so good tip. Thank you. Charlie’s is known for its caramel rolls although I’ve never had one. It’s such a quaint place with great food and excellent service. You’ll have to try it! Living near St. Cloud (plethora of chain restaurants), we love to support these small locally owned restaurants. Hemker Park & Zoo has been open for 30 some years but I had never heard of it until recent years, thanks to facebook. They operate with all volunteers aside from the paid zookeeper. It’s extremely clean and the volunteers are very knowledgeable. Thanks for that tip, too, Erin. Charlie, happy to have you visiting your home state via Minnesota Prairie Roots. Welcome. Gotta love Garrison Keillor. Few of these types of water towers exist any more. This one is actually no longer in use, but remains as an icon of Freeport. Most water towers are non-descript orbs. My husbands favorite MN water tower is in Pequot Lakes. It looks like a fishing bobber. My favorite is the tea pot in Lindstrom. Oh, yes, I’ve seen the bobber water tower in Pequot Lakes and, I think even photographed it. I will need to look through my files. I bet you remember the popularity of smiley face everything back in “our day.” I had a smiley face bulletin board even. Wish I still had that. I so agree with the “smiley face” thing! It was great until Walmart seized on it and it became more commercialized (lost some of the cute innocence that I thought it first had. Still like the various “emoticoms” that are available on the ‘net, though! Yes, commercialization can definitely harm how we view something. I agree with you on the Wally ad campaign. You absolutely have to stop at Charlies in Freeport on your next trip to Fargo, which I suspect will be sometime in August. Whenever we go to Fargo to visit my sister-in-law, that is always a destination stop. We make sure we have either lunch or dinner there. One time at the end of the day, we actually scored some free cinnamon rolls. They were so good. Rumor is that Garrison himself frequents Charlies when he is in the area. I recommend the Hawaiian salad. Even more incentive to visit–the possibility of Garrison popping in. Thanks for the tip, Cheryl.